Arguing endlessly and being bitter is not going to change any reality. Suddenly, the US of A is divided. Shockingly polarized. I have been to that great country so many, many times. And I love the people there immensely. Our son lives there, just as several members of our extended families do. Yet, I have never seen so much division out there, ever. Just look at your Facebook feed and you will know what I mean. So many, many, many people hate Trump and fear ‘his’ America. Yet, an apparent majority sentiment against him, and all the fear-mongering and protesting, isn’t going to prevent Trump’s inauguration on January 20th next year. His election is an act of people’s will, of a duly laid out constitutional process. No amount of debate is going to change it. No protests are going to make things any better or different for the protestors. Free speech is enshrined in most democracies in the world. And USA’s is a beautiful, thriving democracy. Yet, even as people are expressing themselves freely, there’s a great deal of angst and intolerance that’s visible, palpable. Political ideology has divided people at a social level. And that’s a sad thing to happen. I believe a conversation that cannot allow a candid, calm and constructive discussion is not a mature one. What we all have to recognize is that whether someone supports one leader or the other, the core issue here is that everyone want better leadership. Each one feels the person he or she is inspired by is a better leader. Now, if you don’t support someone’s choice of leadership, discuss and debate about the leader and leadership – don’t rubbish the person you debate with hoping to win an avoidable, vitriolic argument. This serves no purpose. Actually, honestly, even social media posts serve no purpose in such debates. But they do serve as a means of expressing ourselves freely. Such expression must be respected and any personal or acerbic remarks must be avoided ideally and surely expunged! I have learnt that arguments over anything – not just over a political or academic or religious or ideological viewpoint – serve no purpose. They end up raising the decibel level and increasing acrimony. An argument is really an ego game. It is always fought over who is right than what is right. Interestingly, at a deeply spiritual level, even right and wrong is relative. What may be right to someone may always appear wrong to someone else. Or what may be right now to someone may appear to be wrong to the same person at another time. So, when what is right is debatable, what’s the point in deciding – that too, over a painful, often wasted, argument – who is right? The upcoming Trump Presidency offers us all a chance to evolve into being more tolerant. There’s an opportunity here for us to learn to avoid the urge to belligerently argue. And stop wanting to be right and to be seen as right. If you have an opinion that is fair and constructive, and if you think all parties in the discussion will have the maturity to accept it, express it. If you believe that maturity is lacking in the forum, exercise your right to not participate. Ideally every perspective shared in a discussion must be constructive and must create value. If you can’t ensure that, it’s a simpler and intelligent response to just remain silent. With India going into a very significant election over this month and in May, social media is agog with opinions and views on what people think will happen in the next 45-odd days – who will win, who is worthy of becoming PM and such. But even as people are expressing themselves freely, there’s a great deal of angst and intolerance that’s apparent. Political ideologies are dividing people at a social level. Often affecting old friendships. And that’s a sad thing to happen. I believe friendship that cannot allow a candid, calm and constructive discussion is not a mature friendship. What we all have to recognize is that whether someone supports one leader or the other, the core issue here is that all Indians want better leadership. Each one feels the person he or she is inspired by is a better leader. Now, if you don’t support your friend’s choice of national/political leadership, discuss and debate about the leader and leadership – don’t rubbish your friend hoping to win an avoidable, vitriolic argument. This serves no purpose. Actually, honestly, even social media posts serve no purpose at a nation-building level. But they do serve as a means of expressing ourselves freely. Such expression must be respected and any personal or acerbic remarks must be avoided ideally and surely expunged! I have learnt that arguments over anything – not just over a political or academic or religious or ideological viewpoint – serve no purpose. They end up raising the decibel level and increasing acrimony. An argument is really an ego game. It is always fought over who is right than what is right. At a deeply spiritual level, even right and wrong is relative. What may be right to someone may always appear wrong to someone else. Or what may be right now to someone may appear to be wrong to the same person at another time. So, when what is right is debateable, what’s the point in deciding – that too, over a painful, often wasted, argument – who is right? 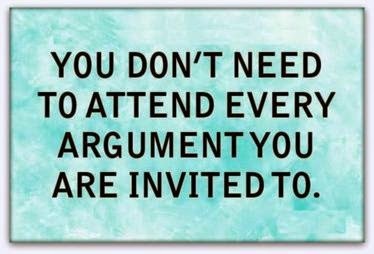 So, in any context, in any situation, avoid the urge to argue. And stop wanting to be right and to be seen as right. If you have an opinion that is fair and constructive, and if you think all parties in the discussion will have the maturity to accept it, express it. If you believe that maturity is lacking in the forum, exercise your right to not participate. Ideally every perspective shared in a discussion must be constructive and must create value. If you can’t ensure that, it’s a simpler and intelligent response to just stay silent.